A College Goal Sunday workshop will be held from 1-4 p.m. Feb. 12 in Room 219 of the B&O Building at West Virginia Northern Community College’s Wheeling campus. Financial aid experts from WVNCC, West Liberty University and Wheeling Jesuit University are scheduled to assist those filling out FAFSA forms. 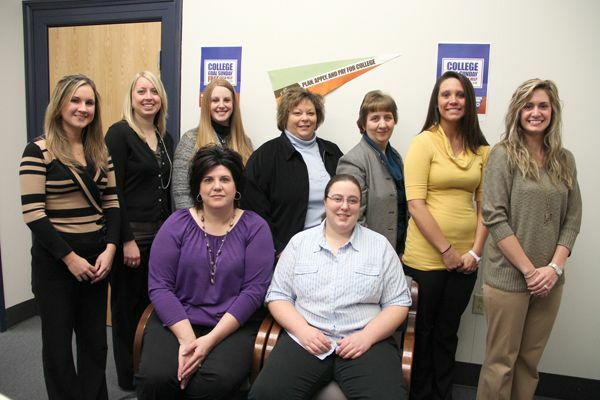 They are, standing from left, Kelly Herr, program coordinator financial aid, WVNCC; Alicia Frey, associate director of financial aid, WVNCC; Molly Daniels, financial aid assistant, WJU; Christie Tomczyk, director of financial aid, WJU; Janet Fike, vice president of student services/director of financial aid, WVNCC; Katie Mills, director of financial aid, WLU, and Michelle Bonaventura, financial aid counselor, WLU. Seated from left are Kim Hart and Sarah Griffith, both financial aid assistants III, WVNCC. West Virginia’s Annual College Goal Sunday event this month is being held on the Wheeling campus of West Virginia Northern Community College, from 1-4 p.m. on Feb. 12, through the partnership efforts of WVNCC, West Liberty University and Wheeling Jesuit University. College Goal Sunday is an opportunity for students and families to get free help completing the Free Application for Federal Student Aid (FAFSA.) This year’s popular event will be held in Room 219 of the WVNCC B&O Building, 1704 Market St., downtown Wheeling. Financial aid experts from all three institutions of higher learning will provide assistance in filling out the FAFSA, the cornerstone of the higher education financial aid application process. Room 219 serves as a computer lab at the college, which is one of 19 locations throughout the state that will be conducting College Goal Sunday events. The FAFSA is a crucial step for all students who plan to pay for any college with the help of grants, scholarships, work-study funds and/or student loans. The workshops are for high school seniors wishing to attend college, for current college students who need to refile their FAFSA and for students who may need to correct or amend an already filed FAFSA. Janet Fike, vice president of student services/director of financial aid at West Virginia Northern, explained that the financial aid experts from WVNCC, WLU and WJU will be available to give one-on-one confidential support to anyone planning to attend college, regardless of their age or income. Refreshments will be available. Individuals who plan to attend college and would like help with completion of the FAFSA or would like answers regarding general financial aid questions are encouraged to attend. Interested students, spouses and parents are asked to bring their Social Security numbers, 2011 Federal Tax Return, W-2 forms, other income records, driver's license and other valid ID to the session. Organizers explained the more income information that families can provide, the more likely they will be able to submit their FAFSA on the day of the event. If 2011 tax records are not available, 2010 records may be used. However, the FAFSA will have to be edited later if information from 2010 is used. All the financial aid volunteers at College Goal Sunday workshops are experts who will not share families’ information. Students who participate will submit the FAFSA onsite, through the federal government’s online form, which is completely secure. Students who participate in a College Goal Sunday workshop will be entered for a chance to win an Apple IPad, with one to be awarded at each location. For complete details, including directions and a list of what to bring, visit www.cfwv.com. College Goal Sunday in West Virginia is coordinated by the College Foundation of West Virginia, an initiative of the West Virginia Higher Education Policy Commission in conjunction with the West Virginia Council for Community and Technical College Education, the West Virginia Department of Education and West Virginia GEAR UP.